↑ The name of his father has sometimes been given as حجاج (Ḥajjāj) instead of الحجاج (al-Ḥajjāj). The name of his great-great-grandfather has variously been given as كوشاذ (Kūshādh or Kawshādh), كرشان‎ (Kirshān, Kurshān , or Karshān), or كوشان (Kūshān or Kawshān). ↑ अ आ इ ई Abdul Mawjood, Salahuddin `Ali (2007). The Biography of Imam Muslim bin al-Hajjaj. translated by Abu Bakr Ibn Nasir. Riyadh: Darussalam. आई॰ऍस॰बी॰ऍन॰ 9960988198. ↑ ‘Awālī Muslim: arba‘ūna ḥadīthan muntaqātun min Ṣaḥīḥ Muslim (عوالي مسلم: أربعون حديثا منتقاتا من صحيح مسلم) (अरबी में). 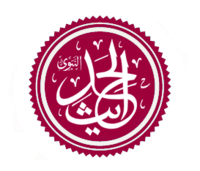 Beirut: Mu’assasat al-kutub ath-Thaqāfīyah (مؤسسة الكتب الثقافية)‎. 1985. ↑ अ आ Siddiqui, Abdul Hamid. "Imam Muslim". अभिगमन तिथि 29 October 2012. ↑ अ आ Ahmad, K. J. (1987). Hundred Great Muslims. Des Plaines, Ill.: Library of Islam. आई॰ऍस॰बी॰ऍन॰ 0933511167. ↑ अ आ Ali, Syed Bashir (May 2003). Scholars of Hadith. The Makers of Islamic Civilization Series. Malaysia: IQRAʼ International Educational Foundation. आई॰ऍस॰बी॰ऍन॰ 1563162040. ↑ अ आ Ahmad ibn Muhammad ibn Khallikan (1868) [Corrected reprint]. Ibn Khallikan's Biographical Dictionary. III. translated by Baron Mac Guckin de Slane. Paris: Oriental translation fund of Great Britain and Ireland. पृ॰ 349. ↑ al-Qushayrī, Muslim ibn al-Ḥajjāj; Shahryar, Aftab (2004-01-01). صحيح مسلم (अंग्रेज़ी में). Islamic Book Service. आई॰ऍस॰बी॰ऍन॰ 9788172315924. ↑ Lu'lu wal Marjan says 1900; Abi Bakr Muhammad b. 'Abdallah al-Jawzaqi apud Brown, 84 counted 2326.